Preheat oven to 350 degrees. 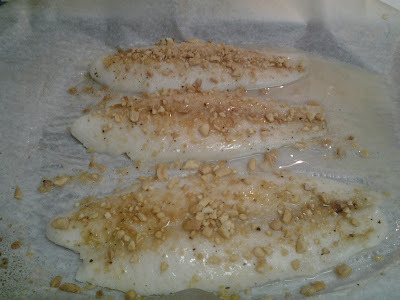 Place fish on baking sheet lined with parchment paper, lightly brush fish with peanut sauce and sprinkle crushed peanuts over fish. Bake 10 minutes or until hot and flakey. Peel oranges and place in blender with juice, parsley, and corn starch. Blend until smooth. Place in small sauce pan and boil until thickened. Place ladle of sauce on plate then cooked fish off to side of sauce. Serve right away. This looks so good! I pinned this and my family and I will be trying it soon. Yum! Yummy! I am always looking for new ways to prepare fish. This one sound great with the orange sauce. Wow this sounds good and I love fish. I will need to try this. This looks yummy! 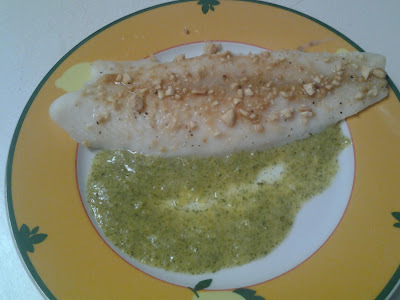 Please share this at Weekend Kitchen Creations, www.weekendkitchencreations.blogspot.com. Join us, share your delicious creation and get other scrumptious ideas. What a wonderful piece of information Admiring the time and effort you put into your blog and detailed information you offer! I will bookmark your blog and have my children check up here often. Thumbs up! Giveaway Going On Right Now!